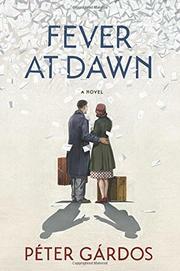 Two Holocaust survivors fall in love at a distance by writing letters to one another in this debut novel. World War II has just ended, and the concentration camps have been liberated. Miklos and Lili, both Hungarian Jews, both survivors of the Belsen camp, are taken separately to two rehabilitation hospitals in Sweden, where they each begin a long convalescence. Then Miklos is given a poor prognosis: his lungs have degenerated to such an extent that he can expect to live for only six more months. Miklos responds to the news by beginning a letter-writing campaign. After obtaining the names and addresses of all 117 Hungarian women convalescing in Sweden, Miklos writes a flirtatious letter to each one. A few write back, but it’s Lili, a sweet and spirited girl, with whom Miklos develops a rich, and romantic, relationship. While their doctors hector them about their health, Miklos and Lili exchange letters, sweets, and kisses. Meanwhile, Miklos is in open rebellion at his own prognosis. This is the first novel by Gárdos, an award-winning film director in Hungary. In a note at the back of the book, Gárdos explains that the story is based on his own mother and father’s courtship; the excerpts from Miklos' and Lili's letters in the book are the letters they exchanged in real life. Indeed, Miklos is often referred to by the narrator as “my father.” It’s a charming story, but as a novel, the work has the flattened quality of a children’s book or a pantomime. It isn’t just history, or even the plot, that’s been flattened: it’s also the characters’ desires, motivations, and reasoning. All that charm crystallizes into something too precious, too cute. Nothing feels quite real: not the war, not Miklos’ illness, not even the petty envy of one of Lili’s friends. It reads like a fairy tale but with lowered stakes and a predictable ending. A novel about star-crossed lovers fails, in the end, to come fully to life.